Rivalo is a new betting company. It was established in 2013 in Curacao. But in reality Rivalo is not so new as we think. The company belong to the big sports betting company Tipico. It has the same website functionalities like Tipico. You will see only small changes in the colours of the design. Why was Rivalo startes. Since Tipico didn't have a licence for some countries, their new company should be able to take bets from countries that Tipico don't support. Rivalo is accepting now bets from Switzerland, Brazil, Turkey and Mexico. So Spanish is a main language for Rivalo business. 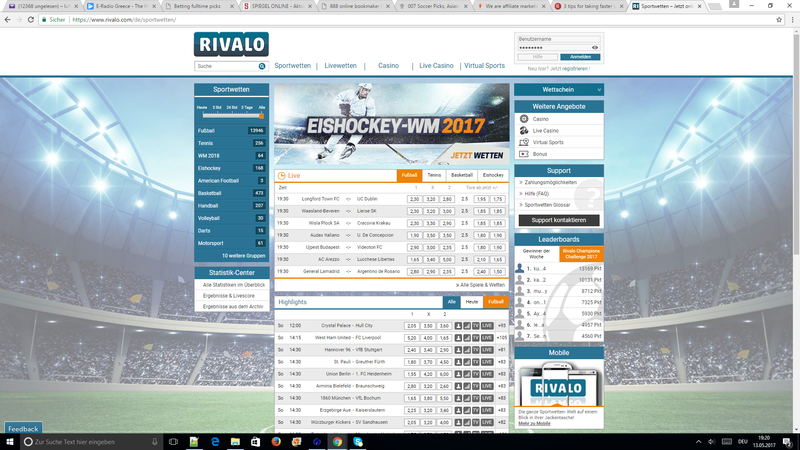 In Rivalo you will find exactly the same betting conditions and games like in the Tipico website. The accept some new currencies, CHF, Turkish lira and Mexican pesos. The bonus offer from Rivalo is 100% percent deposit bonus up to 100€. When a player make a deposit he will get immediately the double amount in this betting account up to 100€. To withdrawal the bonus the player need to bet the deposit bonus three times. But that's not all. Rivalo gives to the betting players many free bets from time to time. So it is very usual that players receive a free bet of 20 euro for special games. To be able to withdraw the bonus you have to bet the bonus three times within 60 days. Players can divide their betting tickets in many tickets to claim easier the deposit bonus. Rivalo offers many football matches for betting. Unless football you will find all other kinds of sports. In the casino section you will find live casino games with real deals for blackjack and roulette. Also you will find a lot games for live betting. Rivalo is famous for his very user friendly design. After you have open an account in Rivalo you are able to make a deposit. For that you can use all the options we have listed in the above table. When make a deposit immediately you will receive the double amount in your betting account. The deposit is absolutely free, there are no fees.